For almost thirty years, Dr. Tim Tooten Sr. has covered the education beat for WBAL-TV 11 News. Tooten is widely respected in the news business and has won a number of awards for his broadcasting work. But away from the camera, Tooten’s passion lies in sharing the “Good News” as pastor of Harvest Christian Ministries in Baltimore. 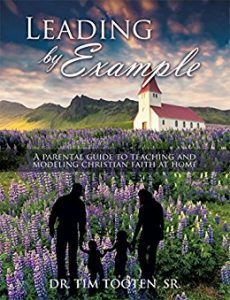 Combining what he has seen as an education reporter with a heart for helping today’s Christian families connect, Tooten recently published, “Leading by Example: A Parental Guide to Teaching and Modeling Christian Faith at Home” (Xulon Press). 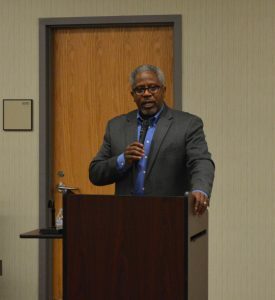 We caught up with Tim Tooten last Monday night, as he addressed a group at the Owings Mills branch of the Baltimore County Public Library. Tooten is married and the father of three children and two grandchildren. A graduate of Florida State University, Tim holds a Doctor of Ministry degree (D.Min.) from Virginia Seminary in Lynchburg. He also received his Master of Arts degree from St. Mary’s Seminary and University Ecumenical Institute of Theology in Baltimore. Tooten said his book is written in a guide-book style and is meant to be used that way. For those who wish to dig deeper into the faith, the book also references more than sixty other writers. “Some of the principles in the book, when it comes to faith, include prayer – how can I approach prayer with my children and make it understandable? Love is another subject. I talk about the problems which are facing the family. What parents face today may not be the problems our parents faced. So we talk about prayer, faith, the books of the Bible – things that families may or may not know. And these are lessons you can share with children at the dinner table. “Well, what if we did that in all other areas? Does Tooten address the areas of conflict between modern education and a biblical faith? “I use data gleaned from the Maryland Department of Education to talk about the challenges faced in our school system, but in the end, parents have more time with their kids than the school does. Unfortunately, on Sundays, soccer fields are full, while the numbers in churches are decreasing. “There has been a shift in priorities and many challenges are being taught in the secular world. Rather than beat parents up, I say, ‘Hey, take time in your day to do things with your children that are fun activities, but also take a moment to put something else on that hard drive. “When kids come home from school, that’s a great time to have a conversation. I’m not sure the dinner table as we once knew it exists anymore. But even at the bedtime hour, that’s a great time to share our faith. Tooten believes that part of doing “the best we can” is being prepared to share the faith. But even more important is living a life which jibes with Christian teachings. “The first lessons in the book ask the question: ‘What do you know?’ The questions allow parents to brush up on their faith before they sit down with their child. There can be overkill (when it comes to religion), and too much structure in a child’s life, but kids pick up everything. They see if the person you are on Sunday is the same person you are the rest of the week. Editor’s note: This is the twentieth part of an ongoing series which looks at the places and people that make up the rich history and diverse nature of spirituality, belief, and observance in Baltimore and beyond. Read the series here.